Certain geographical factors determine our creative lives. When you travel around Figueres in Northern Spain you quickly see why Salvador Dali painted in ambers and ochres; it’s in the landscape all over the area. Whole views look exactly like his paintings. Writers often explore the issues that surround staying or leaving a hometown to head for the city; one could say it’s a dominant theme in American literature. Keith Waterhouse’s ‘Billy Liar’ isn’t just set in the North – it feels Northern, to the point where London becomes a mythical place no-one has visited. The influence of proximity to the water tends to feature more in Canadian and US novels, despite the fact that London is only approximately 47 miles from a coast. For many Londoners it might be five thousand miles away. We never go there. Coastal towns are synonymous with being run-down and badly managed by corrupt councils. To see the decline in once-great resorts one need only look as far as shabby, dirty Brighton, with an embarrassing space needle replacing the formal elegance of its lost pier. The coast affects London. One clue is that the city is surprisingly full of seagulls. My father would always gloomily predict rain as seagulls appeared inland. He could never cope with the fact that London is nearer to France than it is to Cornwall. That strip of sea, so narrow it was called a ‘channel’, remained an insurmountable wall. Most of his family had worked on water as Thames lightermen, and the river’s tides (which have an unusually high range) affected our moods. Equally, I look at maps of places I’ve never been in America and wonder how, say, growing up in Kansas affects one’s idea of coasts and seas. When we’re small the immediate area we can walk around forms the perimeter of our world, and informs our imaginative abilities. London’s greenery is absurdly generous. There’s no way of avoiding it wherever you walk. The photo at the top is Blackheath, where I played as a child. It still had hilly sections then, and was within walking distance of our front door. I still dream of its lush greenery and its attached parklands, domesticated in a very British way that makes US parks, with their hiking trails and areas of scrub, feel alien. London’s parks, woodlands, ancient forests, secret gardens, informal community parks, tended meadows, play areas, crescents, allotments, polygons, circuses, heaths and commons each have a different character. Add to these our obsession with back gardens (not places to be kept beautiful but somewhere messy to escape to) and you start to think that these ‘wild chambers’ are there to stop families from going mad. Landscape / environment: for 5 interesting years I lived in a a rented Victorian 3 storey house overlooking the entrance of the river Tyne at North Shields. For an unrecalled reason I had a brief interchange with someone in the centre of the USA (might have been Kansas, Toto) ‘Tell me what sort of place you live in’ he asked ‘I’ve always been interested in Europe’. I told him that from my bedroom window I could look down 150 feet to a quay filled with fishing boats and 2 ancient lighthouses, looking straight across the river I could just see the Roman Fort reconstruction at South Shields. To my left I could just see Tynemouth Castle and the statue of Lord Collingwood who was with Nelson at Trafalgar, as well as the Tyne piers and all the shipping that entered the river. Two streets away was the square where Stan Laurel lived while his father ran music halls in the town. If I looked to the right I could see the last cranes in the shipbuilding yards at Wallsend where the roman Wall ends and if I looked just to to the South West is Jarrow, where the Venerable Bede produced some of the earliest English writing and the building he worshipped in still exists. He replied that he could see a railroad depot and track, some grain silos, a main street and nothin much else for as far as the eye can see. 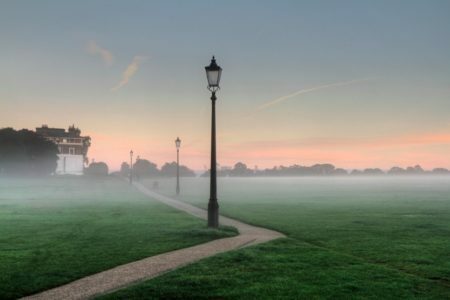 My grandfather lived at Blackheath ( it was not so posh then). Once we walked up to the church there for a christening, carrying the baby and it all seemed very Jane Austen era. My parents were married in that church – St John’s. One of the things from when I was growing up in London ( originally from Bermondsey) was street Markets, I live in Suffolk now but still go back to get that wonderful feeling of a London Street market, they just aren’t the same in the rest of the country. I was born in Brighton and the world of my childhood was D shaped. If you live by the sea it provides a barrier to your wanderings – half of the horizon you see is forbidden to you unless you swim or use a boat. Brighton slopes up toward the South Downs so you are very rarely without at least a glimpse of the sea and it informs your basic sense of direction, it’s very hard to get completely lost. Chris won’t leave anything long winded on here will e mail. The D-shape is a very interesting. My mother was born in Brighton and as a kid I distinctly remember thinking this. It’s off that two of the best places I’ve lived since – Nice and Barcelona – also conform to the D-shape. “Unless you swim or take a boat”. But if you live near the water you would, wouldn’t you? I admit I didn’t boat, because I didn’t fish but I lived in the water in the summer. There was a wonderful beach, picnic tables, and an area for launching boats but no one there to monitor anything. If anyone had got in trouble in the water it would have depended on someone visiting the beach to do something.